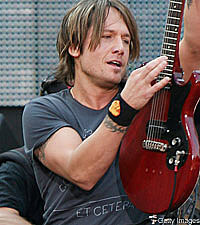 Keith Urban's 2009 concert tour will be one hot ticket! Acts joining him on various dates throughout the trek include Sugarland, Glen Campbell, Taylor Swift, Dierks Bentley, the Zac Brown Band and Lady Antebellum. The tour kicks off in May, following the release of Urban's next studio album. But big names won't be the only draw on the upcoming tour. Says Urban, "We intend to give people their money's worth, for sure ... We'll play for as long as the venues will let us." Your "money's worth" won't necessarily be a whole lot of money. Urban is setting aside special tickets for each show that will only cost $20. "If these ticket prices can help some to let loose, forget about the daily grind and enjoy a night of music, then that's what we intend to give them," says the country superstar.